It seemed terribly familiar. That's because it was. 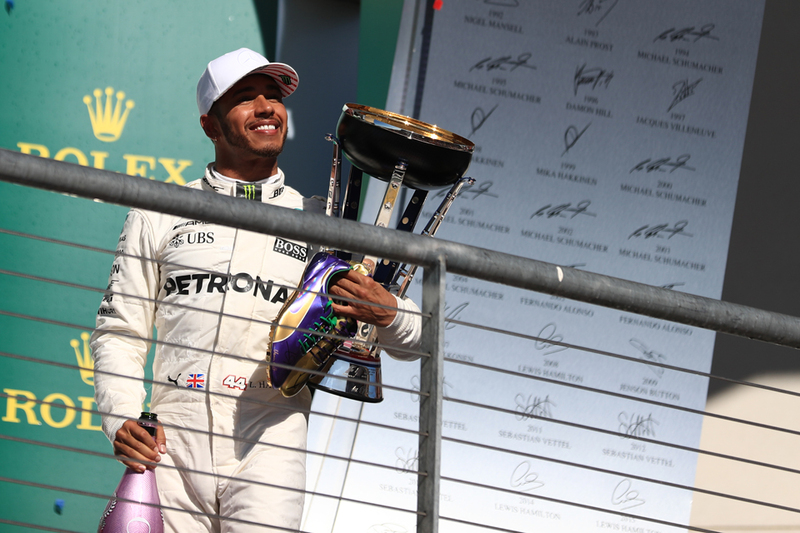 Lewis Hamilton took his fifth Austin win from six in this US Grand Prix; his sixth US win from seven. And his sixth win from the last eight rounds anywhere. Thus his fourth world title is further cemented. Short of Sebastian Vettel outscoring him by 17 that will be confirmed next week in Mexico. That particular one was inevitable anyway, and it feels now like we're going through the motions before the inevitable is confirmed. But no one is going through the motions as impressively as Lewis. 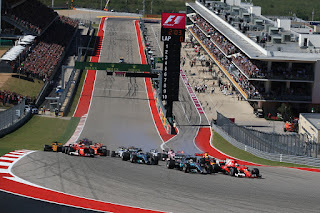 It threatened, briefly, to get interesting over first place in this one, as Vettel's Ferrari from second had much the better start and took the lead from poleman Lewis, elbowing ahead on the inside of turn one. But, as noted, it was fleeting. On lap six Lewis with cruel ease got by to lead, on the long straight. Even the pass was familiar - it made it four Austin wins from five for Lewis that featured an on-track overtake by him to lead. Indeed the pass was a mirror image of two of the previous ones. From then on the only threat was when Mercedes left him out oddly long before pitting, and rejoined from his solitary stop just before the already-pitted Seb. Otherwise Lewis's advantage was balmy. "We have to admit that today in the race we couldn't do their pace," said a sober Vettel afterwards. "It's not down to strategy. Whoever is fastest usually has a good chance at winning. "When he [Lewis] got past he was just playing." Lewis's take however was that the culprit may have been closer to home. "Naturally when Sebastian got a better start than me I didn't know how it was really going to go. But then I noticed I was able to remain relatively close," he said. "I could see him pushing, and I'm thinking I'm pretty good on my tyres right now and he's going to quick in that corner and he's going to kill his tyres. And that's what he did. The temperatures would have been going up. "He's made a few mistakes, he was locking up, I was like 'I've got this'". And in another familiar aspect Mercedes confirmed its fourth constructors' title in a row with this result. This meant Lewis was in suitably reflective mood. "I want to say a big congratulations to the team, I'm proud to have been a part of getting all those points for the team. "Everyone's worked so hard back at the factory to come from one aero [set of regulations] to a new era, and arrive fighting a team like Ferrari and getting stronger through the year, that's such a great feeling." Still it was a diverting affair more generally, with plenty of good dicing and overtakes as we often get at this track. 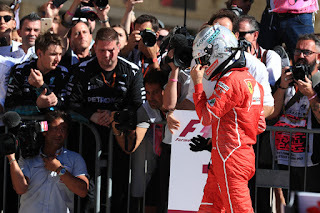 And the fight behind Lewis was close - Vettel's Ferrari, Valtteri Bottas's Merc and Kimi Raikkonen in the other red machine. 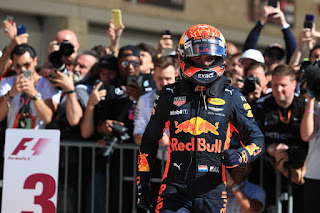 It had spice added too by, again in a familiar sense, by Max Verstappen. His Red Bull rose swiftly from a 16th place start and on his back-to-front strategy got onto the back of the battle for second mentioned. Then he made things interesting by taking on new tyres with 18 laps to go. Kimi not long later got under a passive Bottas at the hairpin to claim P2. And then the freshly booted Vettel and Max got by Bottas as well with a handful of laps left, the Finn now well out of tyres (indeed he stopped for new ones just before the end). Kimi let the much quicker Seb by, then Max homed in on third-placed Kimi on the final lap. For a moment we had heaven, Max somehow getting by Kimi on the inside of the fast Istanbul-inspired turn near the end of the last tour. But... the stewards noticed he'd gone off the track on the inside for a blink in so doing. In that familiar and rueful phrase: 'leaving the track and gaining an advantage'. Their response was swift, a five second penalty reversing the places back before Max had even got onto the podium. Rules is rules, even when they are pedantically applied one supposes. But it was a punch in the stomach to anyone that wants to be thrilled by motorsport. 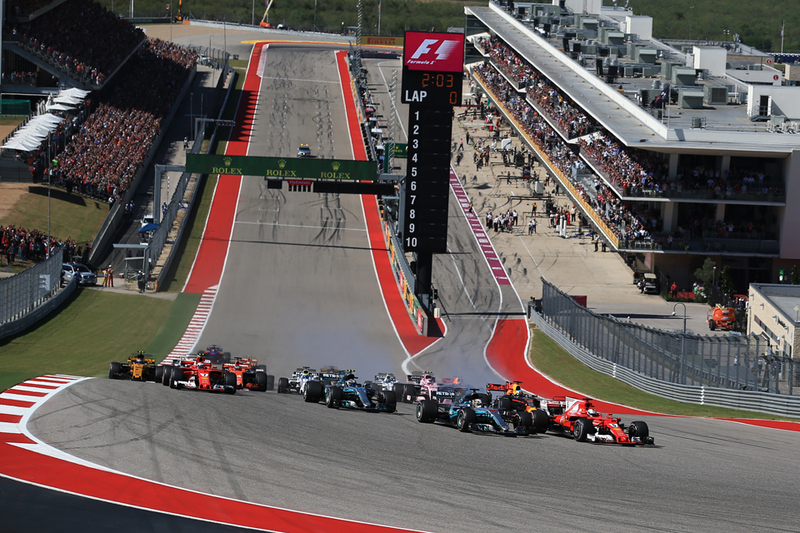 Daniel Ricciardo in the other Red Bull would have been among the fight - and provided early fireworks himself with a couple of bold lunges for Bottas's third place early on, which didn't come off. But he dropped out at a quarter distance with a (familiar) engine problem. Also achingly familiar was that Sergio Perez parked behind his Force India team mate Esteban Ocon, and told his team that he's quicker and the Frenchman should be moved aside. He was told no, and in any case Carlos Sainz before long made the point moot by depriving Perez of his place with a move as good as you'll see. 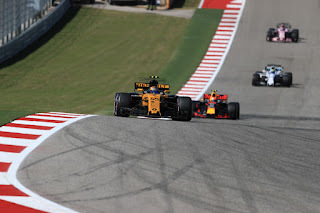 Sainz - looking impressive all weekend on his Renault debut - also attacked Ocon but couldn't get by. Ocon thus finished sixth; Sainz seventh; Perez eighth. Felipe Massa also on a back-to-front strategy got onto Perez's tail, attacking late on ultrasofts after doing the first 30 of the 56 laps on a set of supersofts. He got ninth. And a certain Daniil Kvyat attached himself to the back of this mini-pack and completed the scorers. As it transpired though it didn't aid his chances of another cat-like cheating of F1 death at Toro Rosso, as he rather than Brendon Hartley makes way for the returning Pierre Gasly in Mexico next week. Fernando Alonso was another who would have been in this mix, and another to succumb to an ever-so familiar engine problem. His lament for six or eight points lost was not fanciful. Yet with Lewis Hamilton impressing out front, not all that is familiar about F1 is bad.